I did a series of experiments that examined thermal noise in a Canon 350D camera. This is an executive summary for a series of five experiments. These experiments showed me that it makes little difference if you leave 10 or 60 seconds between subs-exposures (subs). See the graph below. The noise climbs rapidly, as soon as the camera is turned on, and it continues to climb as more time goes by. It makes no difference how long you wait between your subs. When you turn on the camera and take a series of subs the camera is "warming up" and is getting progressively noisier. After 20 exposures it's twice as noisy as when you first turned the camera on. Details of a simple experiment (and also the experimental data) can be found further down the page underneath this graph. The experiments also demonstrated that temperature has a very big effect on camera noise. In experiment 5 it is demonstrated how cooling the camera will dramatically reduce camera noise. This experiment demonstrates that turning a Canon 350D camera on and taking a series of dark frames results in a series of pictures in which the noise steadily increases with each new exposure. 1. A Canon 350D (unmodified) camera was turned off and put on a shelf and was left to adjust to room temperature for over an hour. A digital thermometer (measuring air temperature) was placed a meter from the camera and was also left to adjust to room temperature over the same period. 2. The camera was turned on, and immediately upon being Ready the first dark frame exposure of four minutes duration was taken. 3. Five more dark frame exposures were taken with just a 5 second interval between each exposure. 4. Three four-minute exposures were then taken with an interval of two minutes between them. 5. After this the camera was (within 10 seconds) turned off for 10 minutes. 6. After being left turned off for 10 minutes the camera was turned on again. 7. The last four-minute dark frame exposure was taken less than 10 seconds after turning the camera back on. 8. The RAW files for all exposures were examined in MAXDSLR using Area Mode in the Information window to get statistics on the image pixel values. The values for Red pixels are quoted in a table below. a) It is very clear that as soon as you start taking shots the camera is "warming up" and begins getting noisier. 10% noisier after the first 4 minute exposure. b) It appears that turning off the camera begins to "cool it down" and it begins getting slowly less noisey. c) When the air temperature was 24.7 degrees Centigrade it appears that a two-minute interval between subs halted the rise in temperature. Sub number 7 clearly shows a reduction in noise value even though values were climbing through subs 1 to 6. Canon EOS 350D (unmodified) In-camera Noise Reduction Off; ISO 1600. ** These exposures are dark frames. 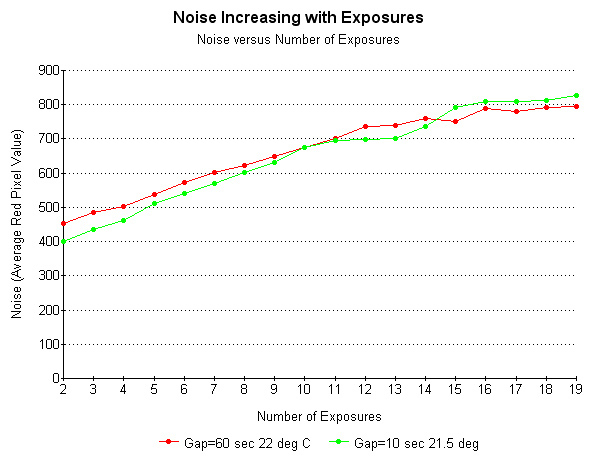 The average value of Red pixels is used here in the table as a measure of noise.